Comparing the 2019 Mazda CX-3 vs the 2018 Ford Escape is a matter of comparing both vehicles’ fuel economy ratings and driver assistance technology. Both qualities are highly-valued in family-focused vehicles such as SUVs, and as a result are worth comparing when trying to decide between two competing vehicles. The 2019 Mazda CX-3 and the 2018 Ford Escape are both compact SUVs that can seat up to five passengers. Drivers who prefer vehicles with great fuel economy should be aware that the 2019 Mazda CX-3 is more efficient than the 2018 Ford Escape. 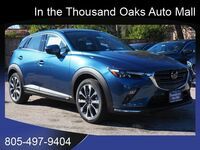 While the Environmental Protection Agency only rated the 2018 Escape for 24 miles per gallon in combined city/highway conditions, the 2019 CX-3 received a rating of 29 miles per gallon. When it comes to driver assistance features, the 2019 Mazda CX-3 provides drivers with several technology systems that are only available through options packages in the 2018 Ford Escape. A frontal-collision warning system and a blind-spot monitoring system both come standard in the 2019 Mazda CX-3, while only certain 2018 Ford Escape models have access to these features. 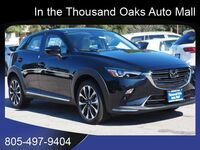 Every 2019 Mazda CX-3 model comes well-equipped, with standard features such as USB connectivity, a six-speaker audio system, remote keyless entry and a seven-inch touchscreen all coming standard in the base Sport trim. Other available features include automatic climate control, a leather-wrapped steering wheel, a sunroof and a heads-up display. 2019 Mazda CX-3 exterior color options include: Machine Gray Metallic, Soul Red Crystal Metallic, Snowflake White Pearl Mica, Ceramic Metallic, Titanium Flash Mica, Deep Crystal Blue Mica, Eternal Blue Mica and Jet Black Mica.